Yesterday, a long line of people stood in Adenauerallee in front of the entrance to Villa Hammerschmidt. Many citizens decided to use the chance of visiting the second office of the Federal President, which opens only once a year to the general public. Guests had the chance to visit the historic rooms of the former Federal Chancellery – today’s Federal Ministry for Economic Cooperation and Development (BMZ) – for example, Cabinet Hall, Chancellor’s Room or Chancellor’s Bungalow. At noon, Federal President Frank-Walter Steinmeier and his wife Elke Büdenbender personally greeted the many guests with an opening speech. In addition, there was a diverse program with international music, dance and discussions. The event was all about sustainability. Therefore, the city of Bonn as well as German and international research institutions presented various projects and activities at information stands and pavilions. 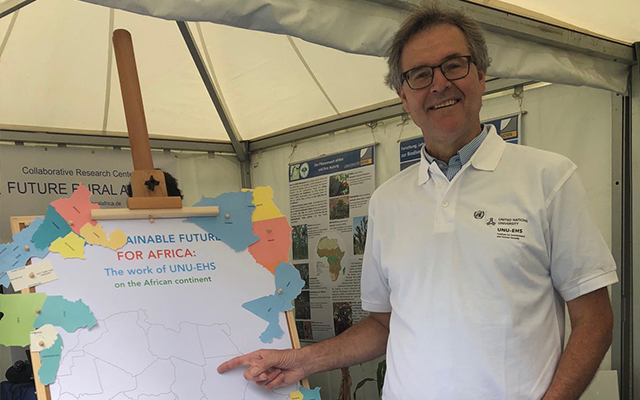 UN organizations were also represented: The Institute for Environment and Human Security of the UN University (UNU-EHS) showcased their work at two pavilions. One focused on the work as a member of the Bonn Alliance for Sustainability Research, in particular the research on the topics mobility and migration. The second pavilion informed about the future of Africa. UNU-EHS Director Jakob Rhyner welcomed the visitors and talked about UNU-EHS projects in Africa. The SDG Action Campaign was also represented with a virtual reality pavilion in front of the BMZ. Through various VR films, visitors could experience first-hand what other realities around the world look like. The films deal with crises that endanger people’s livelihoods such as war, natural disasters or other global challenges such as climate change, pollution and migration.